Following my recent trip to New York I wanted to write about too many art-works to fit in just one post. A few days ago I wrote about installations. Today it is sculptures. West 22 Street seems a good place to start. If you walk down the street between 10th and 11th Avenues you might notice a young tree and beside it, about four feet away, a lump of basalt. At first you might not think it anything special until you spot another one, and then another. New Yorkers would argue that you have just come across part of the famous multi-located artwork by Joseph Beuys, 7000 Oaks. It started back in 1982 when Beuys decided to start his own personal reforestation programme, aiming to plant 7000 trees. Over the next four years he organised plantings mainly in Kassel in Germany. Each tree had an accompanying basalt stele While the trees grew, the basalt would remain the same but the relationship between the two would change. Kassel was not the only town to benefit, Beuys celebrated his sixty-third birthday in May 1984 by helping to plant 400 native tree and bush species around the Italian town of Bolognano. His son Wenzel completed the project in 1987 by planting the final trees on the first anniversary of his father’s death. In truth, Beuys did not single out West 22nd street. After his death, the Dia Art Foundation, which had help fund 7,000 Oaks decided to plant some trees in his name; five trees with steles were planted in 1988 and a second row of eighteen in 1995. They are not all oaks, but then neither were the Kassel trees: 7,000 Oaks sounds a lot better as a title, than 7,000 Assorted trees and Bushes. Are the New York trees a genuine Beuys work or an imitation? If I plant a tree in my garden with a basalt stele, could I too be host to part of 7,000 Oaks? Tempting though it is, I think I will give it a miss. My garden does not have room for another tree and I don’t know where I could lay my hands on suitable basalt. 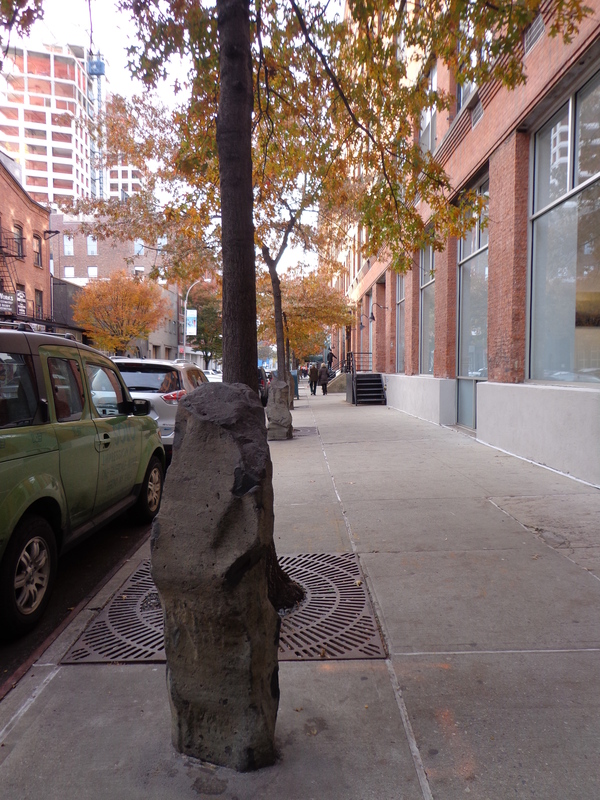 Anyway, I am sure Beuys would have been very happy to have the West 22nd Street trees attributed to him. Last week both the trees and their guardian steles looked great in the autumn sunshine and were an excellent introduction to the surrounding galleries. One of these was the Matthew Marks Gallery. It has a tree and stele just by its front entrance and was showing a most striking work that looked like a huge question mark, or possibly a sperm. 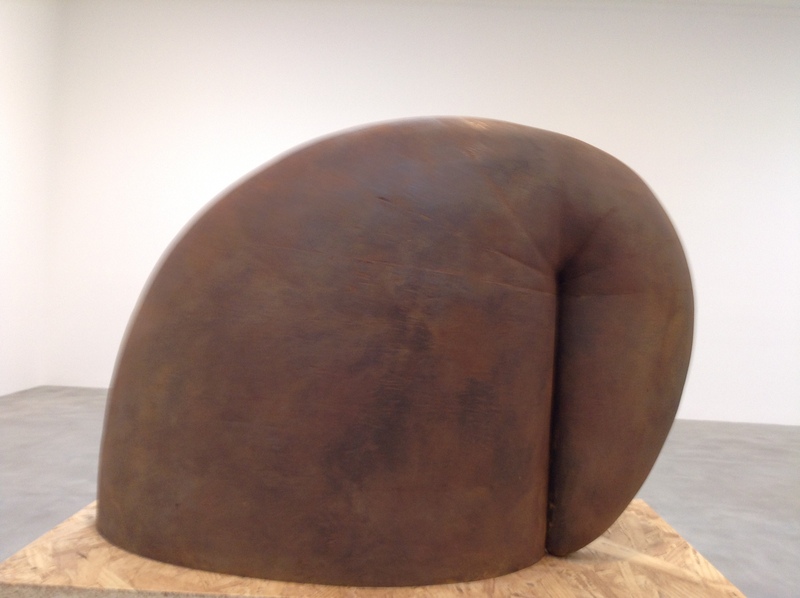 It turned out to be by Martin Puryear, and the first thing that I noticed was how beautifully made it was. In the detail of the different woods, you can see the skill with which it has been put together. 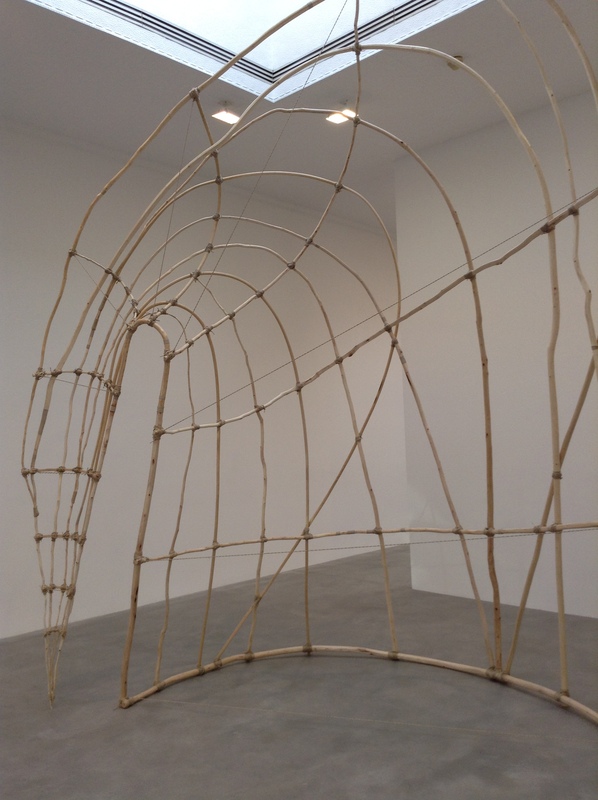 I had not seen Puryear’s works before but they reminded me somewhat of those of the British artist Richard Deacon; they have the same fluidity and the same love of materials. Both were born in the 1940s, Puryear in 1941, Deacon in 1949. I am not the only one who has noticed the similarities. They have exhibited together at least once and both appeared in the 1989 book New Sculptures: Six Artists. 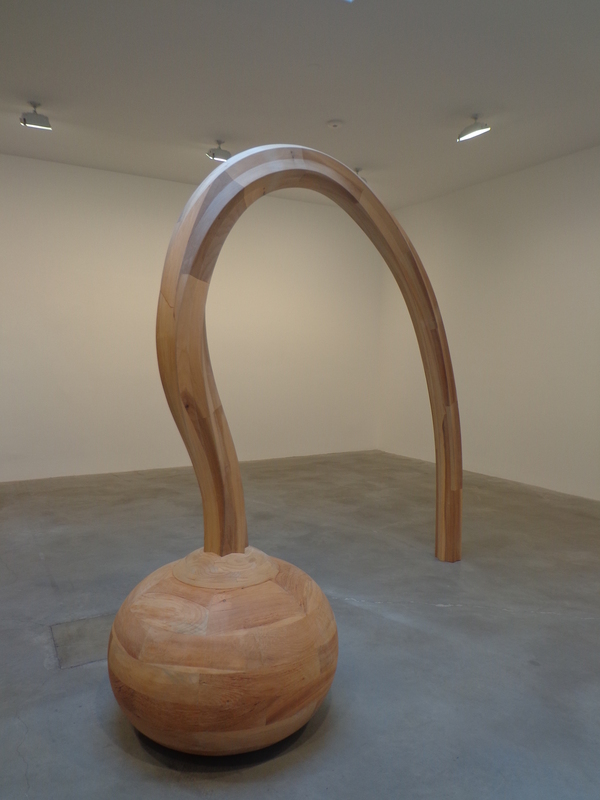 Over in West 24 Street there were more of Puryear’s sculptures. 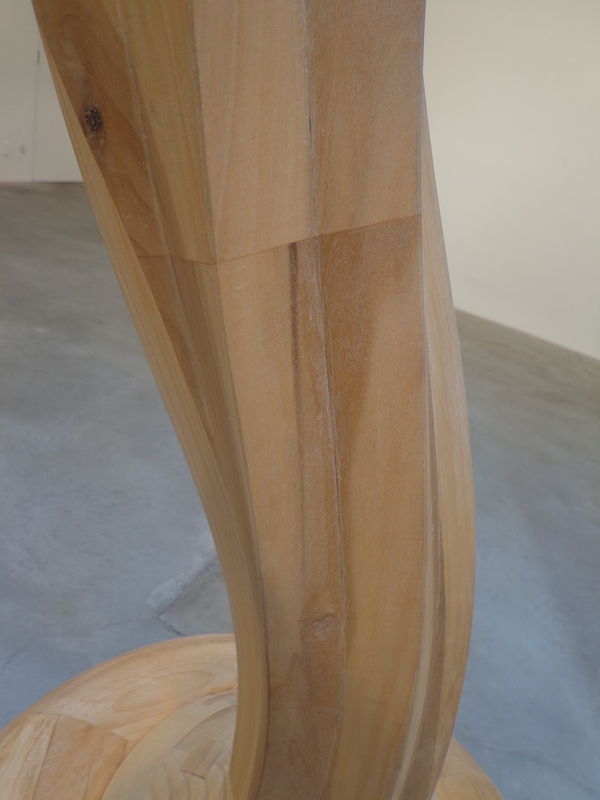 I particularly liked this one of bent wood and string. 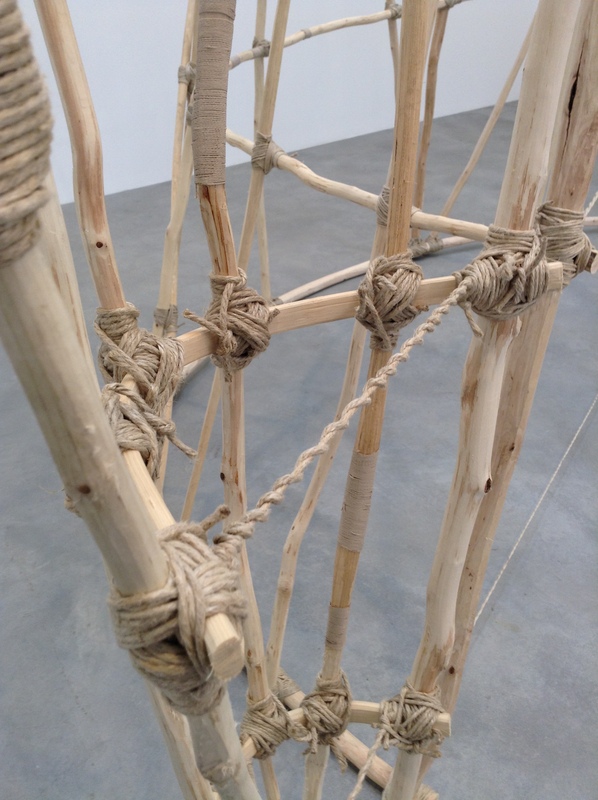 It is not a piece that would fit easily in the elevator, unless it were all untied, but there was something immensely satisfying about its hand-made appearance – all those knots, all so perfect; It comes as no surprise that his past experience includes knowledge of boat building and I imagine sailing. 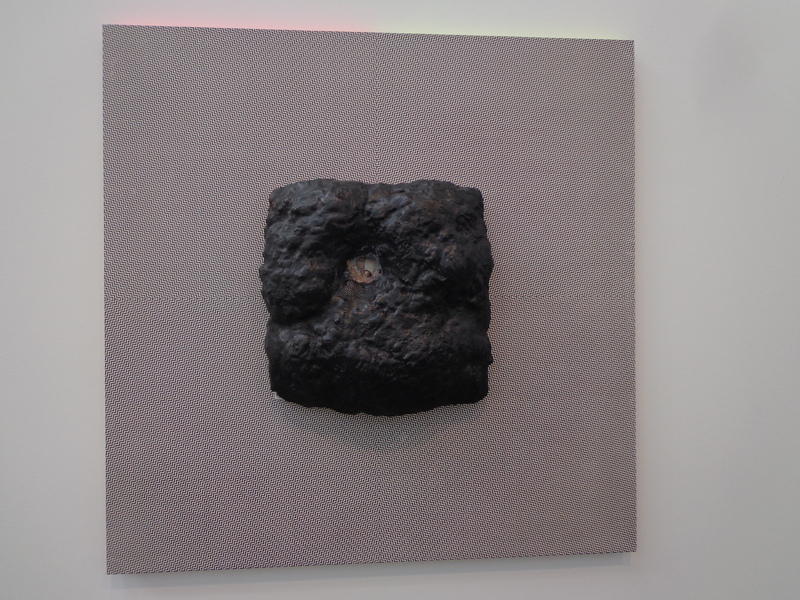 Though a lot of Puryear’s work is in wood; he also uses metal as in this deceptively simple piece; there is the same kind of fold to it as in the bent wood piece above, but this one looks more human, or perhaps more animal. 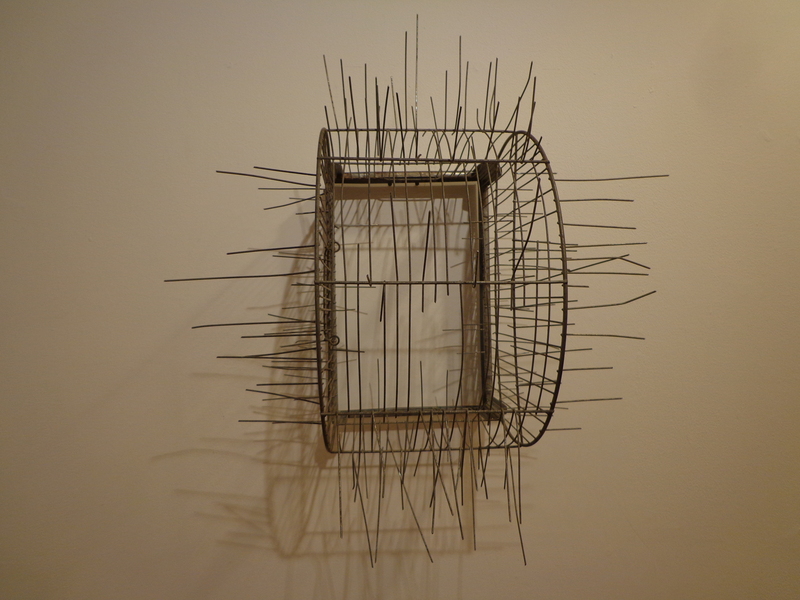 It was also exciting to see works that were made of less traditional materials. 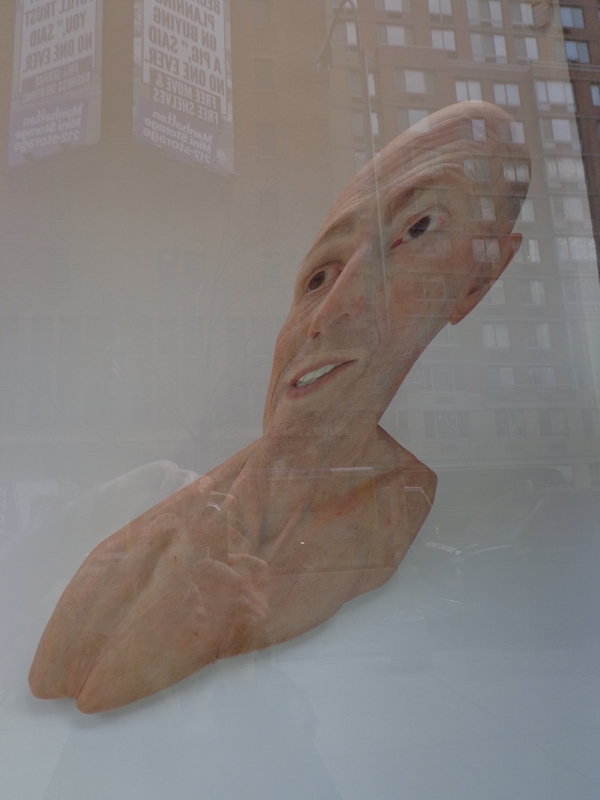 The Hoerle Guggenheim Gallery was showing the most remarkable head. Made out of silicone and human hair it was a self-portrait of Evan Penny. It managed to be both incredibly realistic – it even has eyelashes, eyebrows and a fuzz of hair on the chest, and, at the same time, completely weird because of the size – it is over a meter high – and because of the distortion. It might be rather hard to live with: I would prefer some pleasing bent wood but it certainly caught one’s attention. More male flesh but of a very different kind was provided by the Mark Miller Gallery. The curators there had the interesting idea of showing works by the assistants of well-known artists. This work by Chie Shimizu assistant to Sol Le Witt, was perhaps the most intriguing. 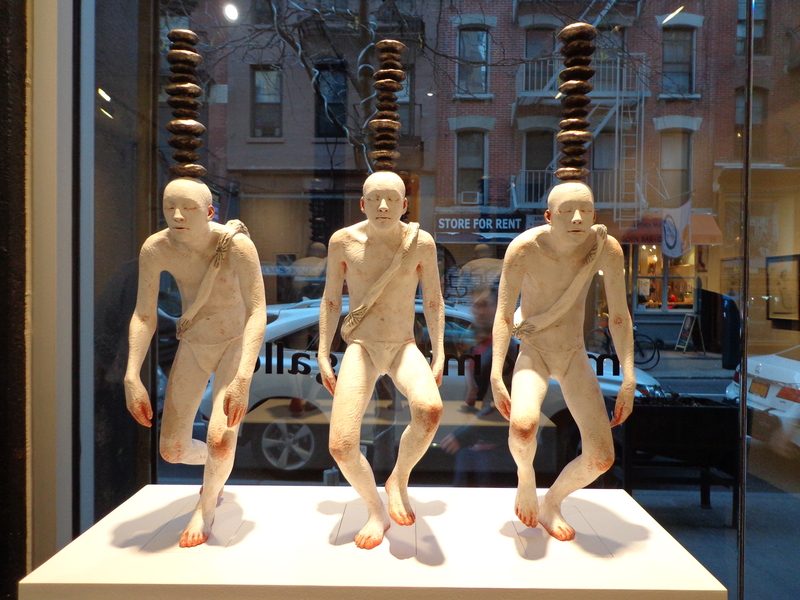 The three figures are apparently carrying their life experiences on their heads. I like the similarity of the figures, their acceptance of their burdens and the fact that they are as interesting from the back as from the front. I am always interested in works which are somewhere between sculptures and paintings and while many of the works by R H Quaytman are definitely two-dimensional silk screens and paintings, the third dimension made an appearance in the exhibition at the Gladstone Gallery whilst retaining a painterly feel to the works. 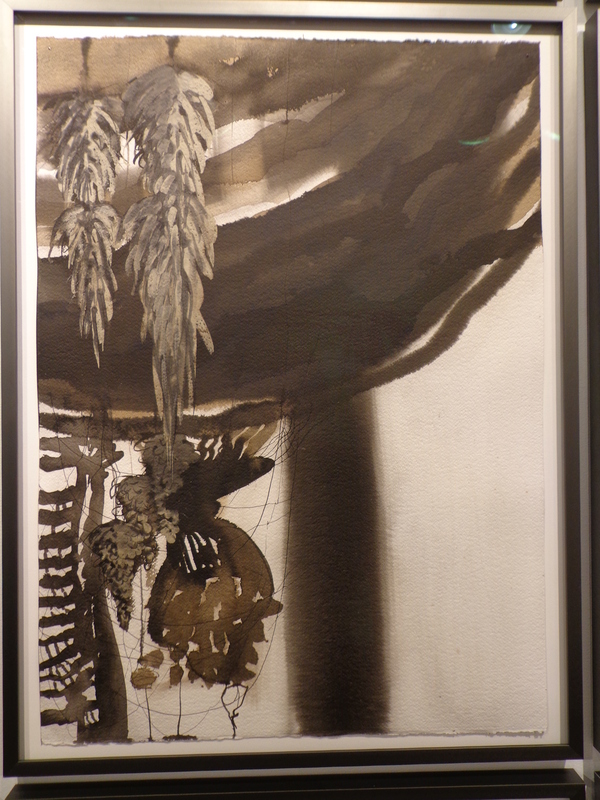 What they are about is somewhat unclear,and of all the works I saw, they were perhaps the most difficult works to understand; the accompanying statements did not particularly help, though it seemed she drew inspiration from a botanical garden in Minas Gerais in Brazil. Commenting on the work, she wrote of the intention to develop a painting model that corresponds with how – not only – what we see. The piece below though apparently mounted on board or canvas is a gigantic presence which stands out from the wall. In others the mass is far more connected to the underlying painting. 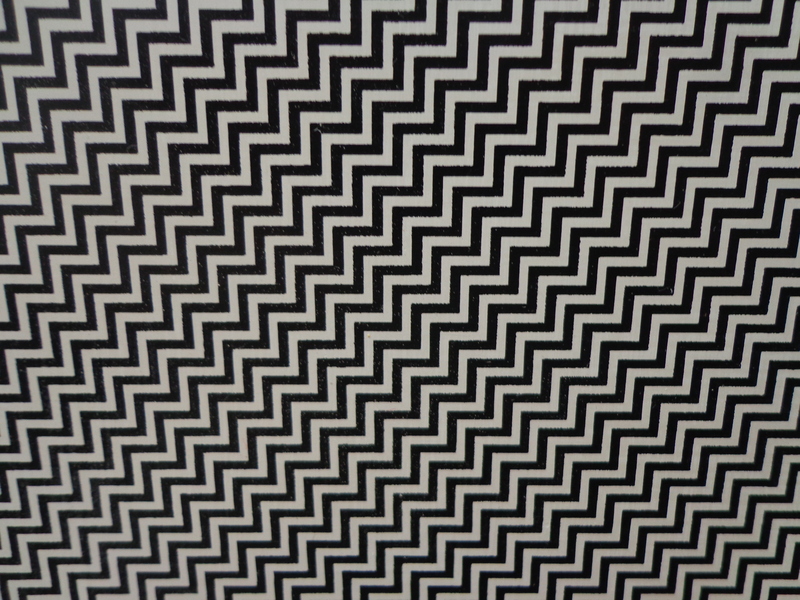 In the one shown below the pattern of the background is causing interference in the photograph,but is highly intricate forming a disturbing contrast with the central form. I was interested in the results she had achieved with her sculptural materials: encaustic, acrylic and polyurethane foam, so much so that I have bought myself a can of foam with which to experiment. 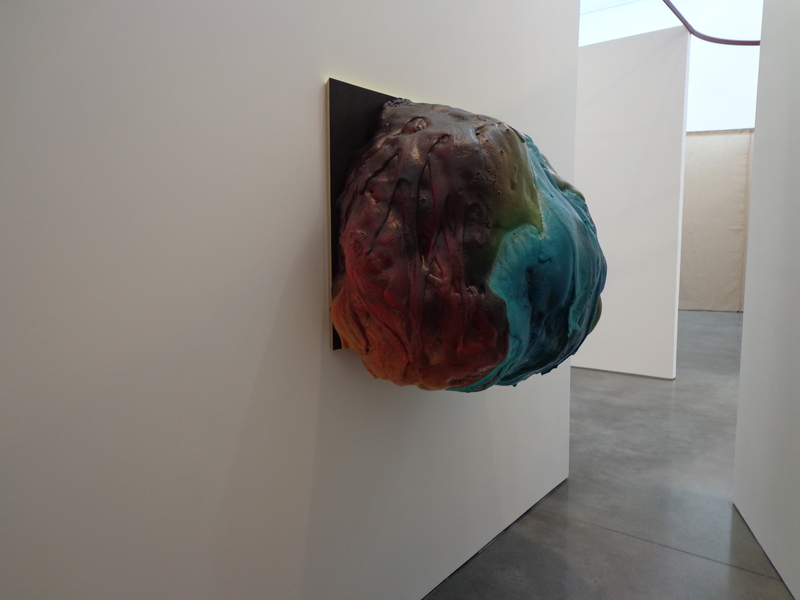 But I would have greatly liked a bit more information about the thought processes behind the works. Far more accessible were the works by Brenda Garand in the Lesley Heller Workspace, entitled Northern Passage. Made out of materials such as steel wire, roofing paper, fabric, wool, silk and rope, they conveyed both strength and fragility. Complex in themselves, their complexity was further enhanced by the lighting which caused them to create fantastic shadows. 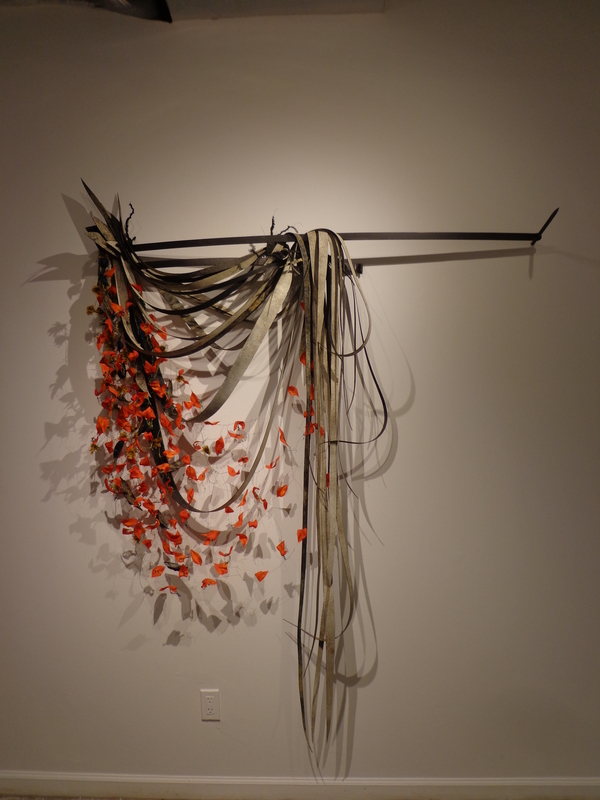 The works remind the viewer of water, leaves and the natural world and reflect her interest in the Northern rivers and the religious concepts of the Algonquin peoples. They are accompanied by her drawings made with clay, and inks. What was interesting here was that you could see at a glance that the sculptures and drawing were done by the same person. The drawings seem complete in themselves not just studies for the 3 dimensional works. 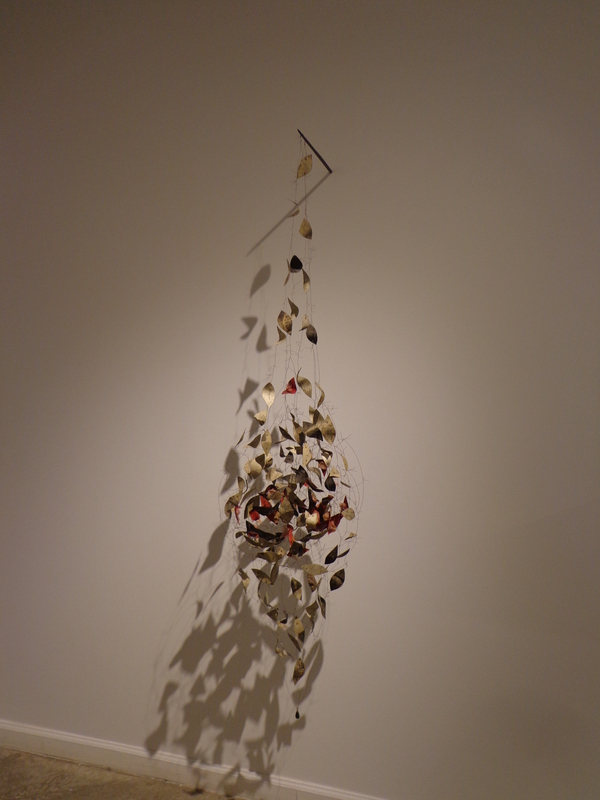 Shadows also played a part in a very different sculptural work by Alberto Borea at the Y Gallery in Orchard Street. Called We are Gone: Intervention on a Metal Cage this was so very simple and so effective; I liked it enormously and wish I had thought of it.